Greetings my ferns! As promised, here is the second preview of my upcoming Mossflower Collection. Bowls of green have been overflowing on my bench for weeks now, clusters of prehnite at every turn. After diligently working on this series during every spare moment and stolen second, I have another preview of my latest batch of pieces to share with you. I set my hand to a few more earring designs. 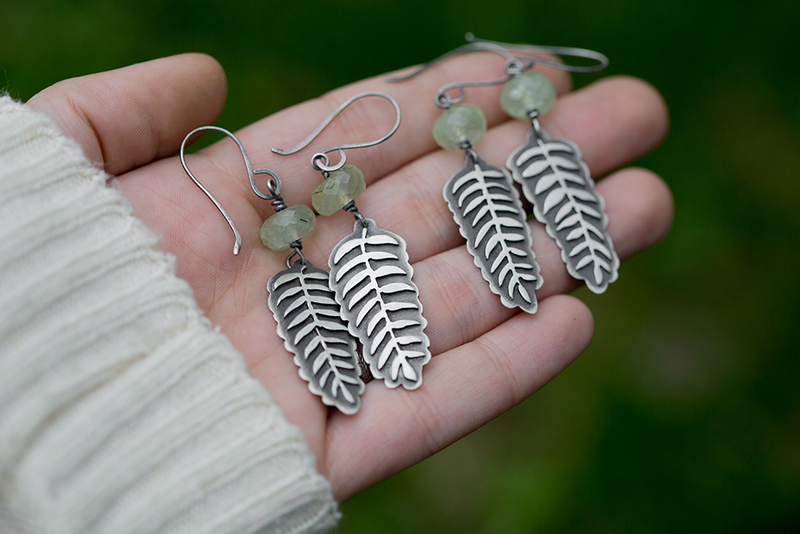 Two pairs of drop earrings with detailed leaf print and little faceted prehnite stone dewdrops swinging low from the ears, like early leaves caught in the breeze. And here is another iteration of the earrings I shared last time. 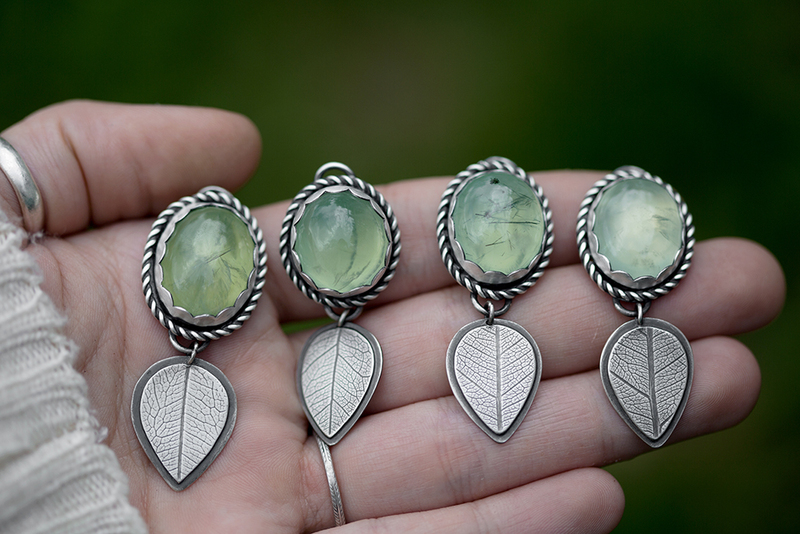 Four pairs of earrings with my greenest prehnite daintily balanced in the middle of a hammered branch. There will be two Sprout Cuffs, as well. 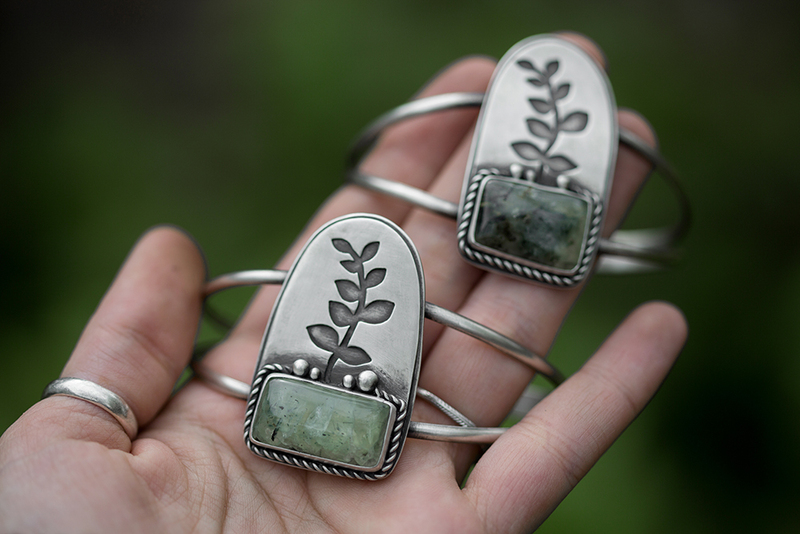 The front of the cuffs feature young ferns delicately unfurling. 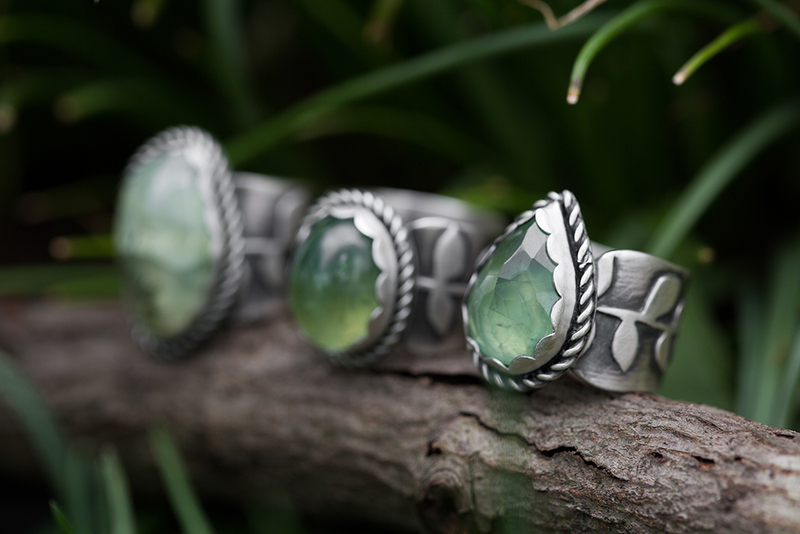 They are shooting up from prehnite foundations through sterling silver pebbles and with a twisted vine border. 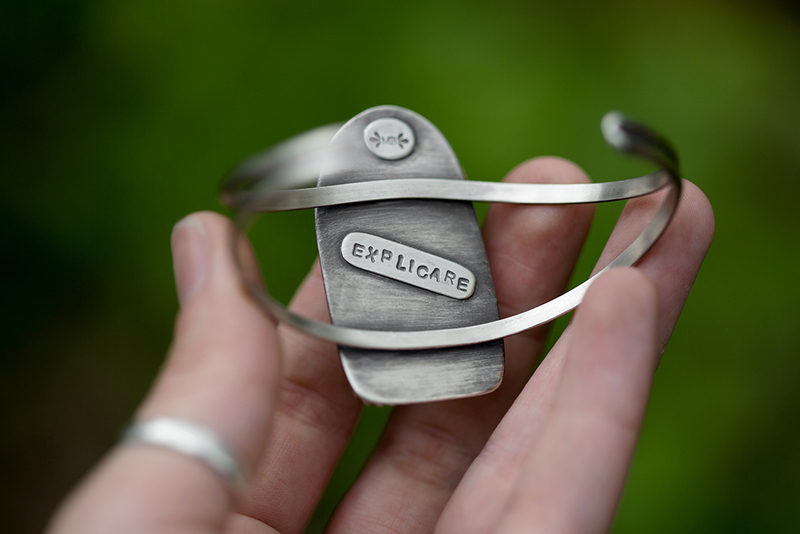 On the undersides of the cuffs, I have inscribed the word “explicare,” which is Latin for “unfurl” or “unfold.” A constant hidden reminder to splay branches and take in the light, to reach into open space with conviction. There will also be four necklaces in this design on adjustable chains with the same message on the back of the pendant. Gentle encouragement to rest against the chest. 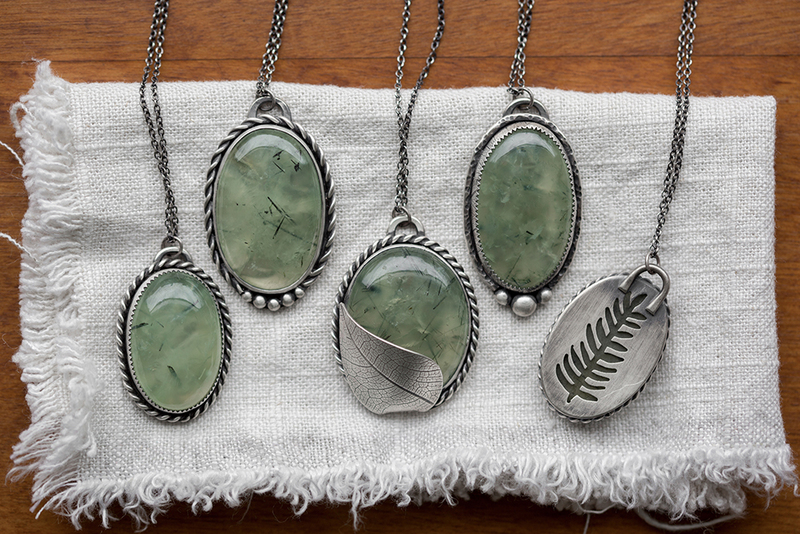 I have made a few simple necklaces for those who wish to carry a bit of subtle springtime. 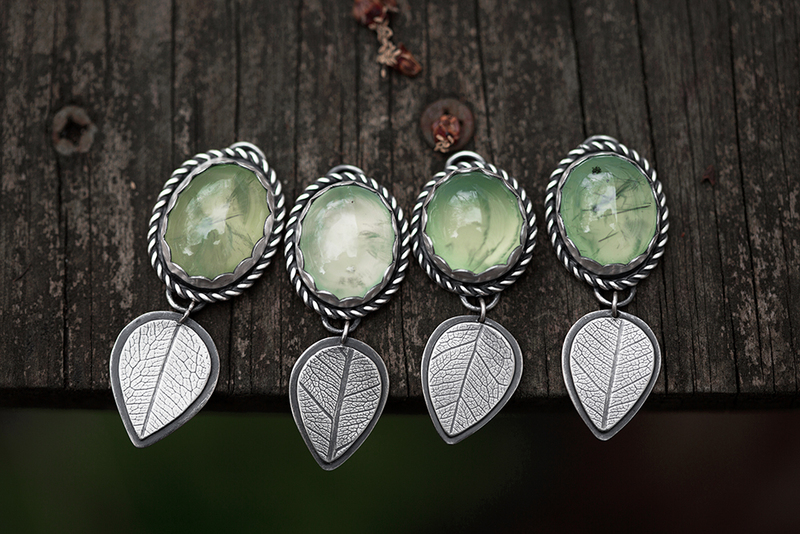 Leafy prehnite set with a twisted vine border and a sterling silver leaf to swing merrily below. Movement is a big part of this collection. I have tried to incorporate a gentle sway, as that of a branch in the breeze, wherever I could. And these two pair of simple drop earrings utilize that movement. 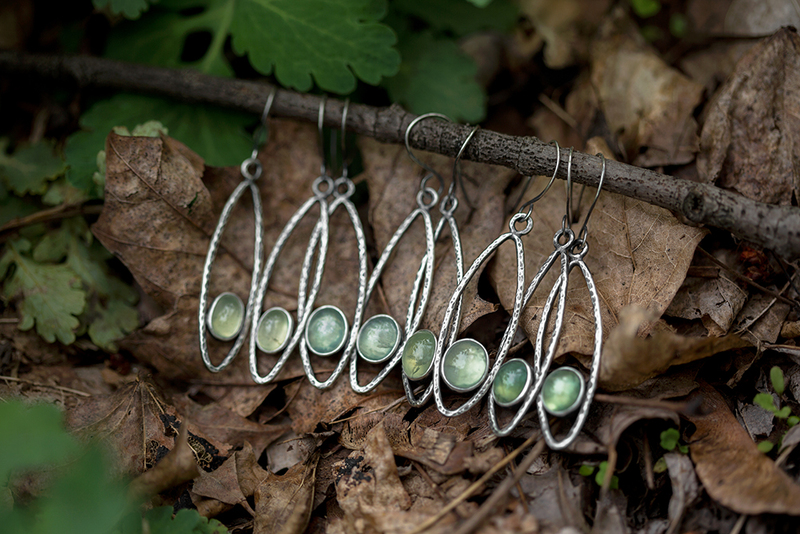 Intricately sawn ferns swing below small prehnite rondelles, faceted to catch the light. So many of you requested for me to revisit designs from last year’s collection, and so I have! 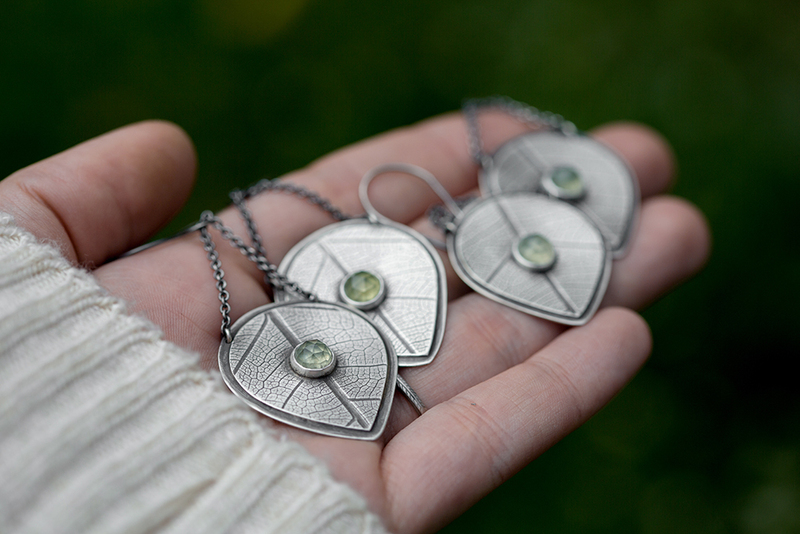 Here are five large prehnite pendants, each uniquely rendered. 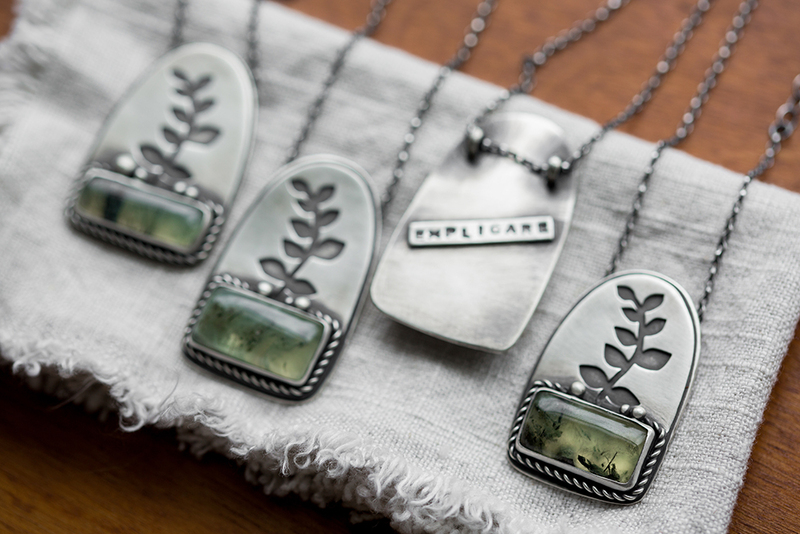 Some have leaf-printed serrated bezels, others have hammered branch borders. 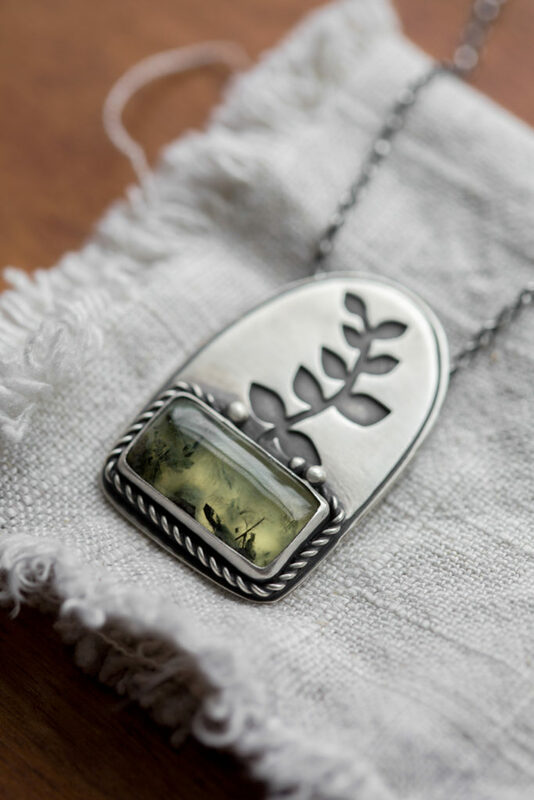 There are sterling silver pebbles strewn about, hand- twisted vines, botanical windows sawn out of the backs of the pendant to let the light through, and new leaves delicately wrapping themselves about the stones. And then there are rings. Of course there are rings. 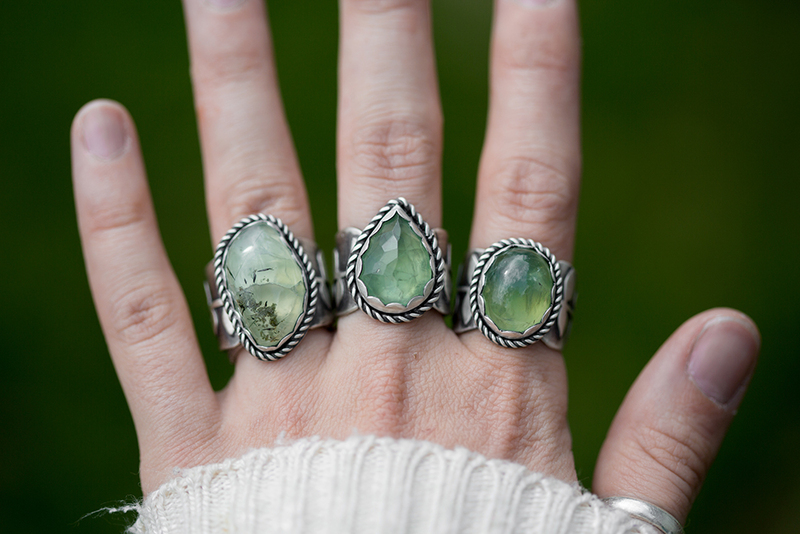 I chose three of my favorite unique prehnite stones from my collection for these three. They are set in undulating scalloped bezels with hand twisted vine accents. 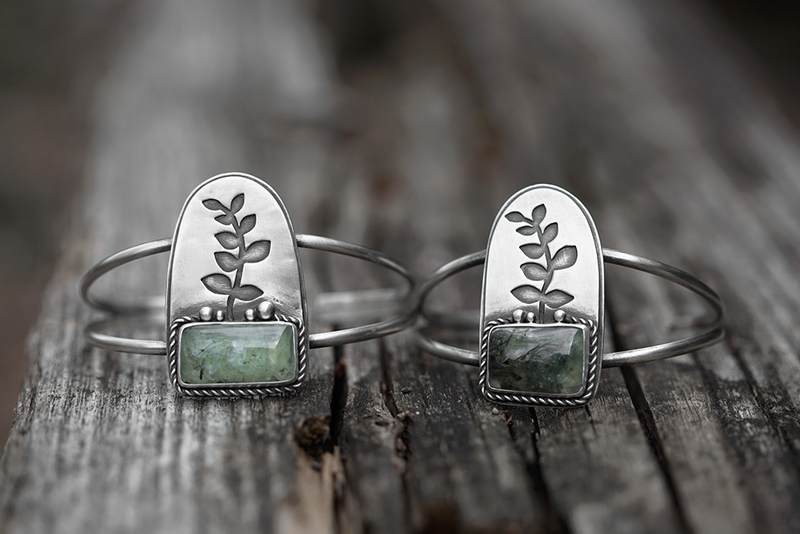 They are set atop wide bands with botanical silhouettes encircling the finger. Rings made for digging hands into earth or plucking fruit from the vine. In the next preview there will be an embarrassment of riches as far as rings are concerned. I have 4 or 5 other ring designs I am working on, so if you have size requests, shout them out in the comments! Stay tuned for a shop update date announcement. I am hoping to have everything complete within the next couple of weeks, which would mean an end of May shop update. Fingers and branches crossed all goes smoothly. Tell me in the comments which design from this batch is your favorite, I would love to know! So many beautiful pieces. I am going to have to study and focus on one, hoping I am lucky. This collection was intentionally a large one. I am hoping that everyone finds a piece that speaks to them and is able to nab it in time! Love the rings, especially the teardrop shaped one! I would love to see some smaller sized rings (4-6)!! so many beautiful greens and leaves and fronds. very fitting for springtime. 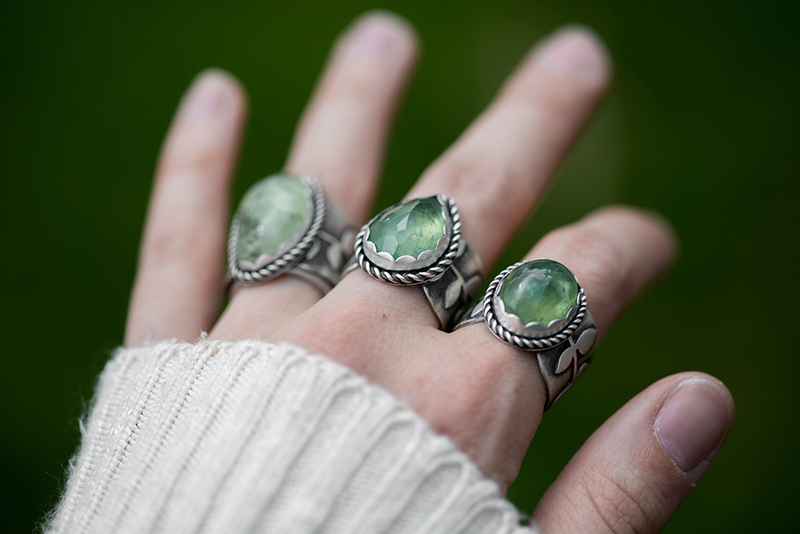 and i can certainly picture characters from tolkien’s stories wearing these jewels! 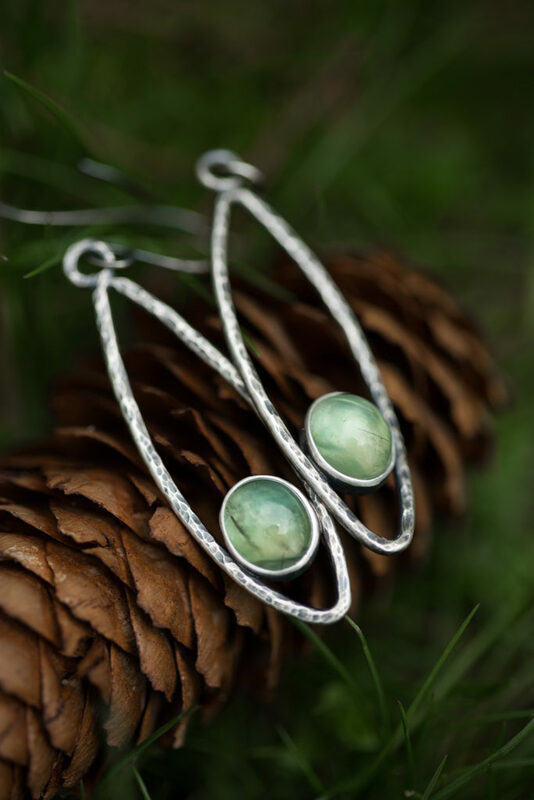 i do love the circle earrings from you last post – as something i would wear and wear often. i will look forward to your shop update! I actually have a jewelry preview coming up entirely dedicated to my experience of reading “The Silmarillion” last month and the pieces I made with one of Tolkein’s characters in my mind. I designed her a ring, a necklace, and earrings. And I have lost my heart to those pieces. That preview should be up in a few days! Sweetie you have outdone yourself! This is an interesting unique collection that I think will hold something for everyone. Well done! Yes, I went a little overboard for this collection. 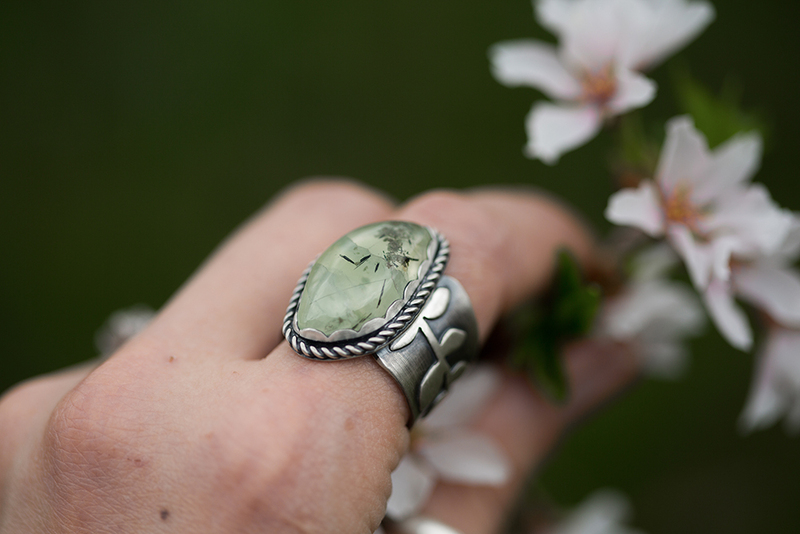 But springtime and Tolkien and the forest positively swept me up, and all I could do is transmute the experience into silver and prehnite. And it has been a long, beautiful spring. Can’t wait for these to go on sale. 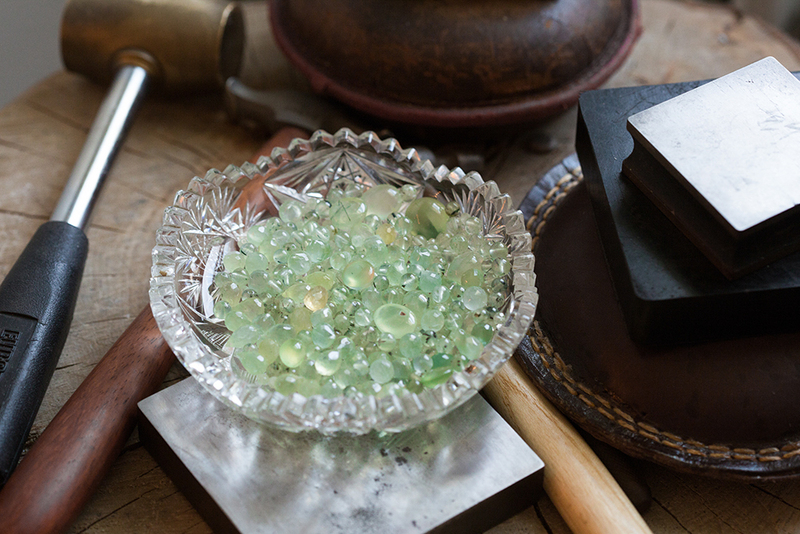 All of your work is drop dead gorgeous.. prehnite being one of my very favorite stones!! I literally love all the designs, the rings, earrings and necklaces are some of my favorites.. as for suggestions for rings sizes, if they are the wide bands needing an increase of 1/2 size from regular sizing, I would love any sizes in an 7 1/2 or 8 1/2! !